Muslim Aid Bosnia successfully completed the Srebrenica Walk, or “Peace March”, in Bosnia and Herzegovina which commemorates the deaths of 30,000 Bosnian Muslims killed in Srebrenica during the 1992-1995 conflict. A team from Muslim Aid joined 3,500 walkers from Switzerland to New Zealand on the 100 kilometre walk across the hills and woods of eastern Bosnia to honour the refugees killed while trying to escape the fighting to reach safe territories. 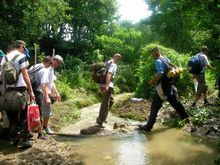 The three day walk from 8th-10th July started in Nezuk, Sapna Municipality and ended in Donji, Potočari-the reverse of the original walk- with camping stops along the way. At the end, the walkers reached the town of Srebrenica to commemorate the 14th anniversary of those who lost their lives. Muslim Aid Bosnia took part in the walk to help raise £10,000 to fund a mobile library and IT centre for children in remote communities in Eastern Bosnia who do not have access to book and skills training. The project is under the umbrella of the Rainbow Family Programme in Bosnia which provides sponsorship for orphans or children from disadvantaged families. Every Rainbow Family child has lost at least one member of his family during the conflict or were forced to flee their homes. “The walk was a very moving experience and very challenging physically. Although I could barely walk by the third day, the only thing that kept me going was the constant reminder of the dangerous journey the refugees had to endure 14 years ago- forced to leave their homes and families behind with no food or clothes and with lives under threat, I felt so lucky in comparison.” said Salma Khattab, Rainbow Family Coordinator and Fundraising officer. The walk was organised by the Board of Committee for the Commemoration of Srebrenica Genocide supported by the Federal Ministry for Refugees, Armed Forces of B&H, Muslim Charity Organisation "Merhamet", Red Cross Society of B&H and Red Cross of the Federation of B&H.